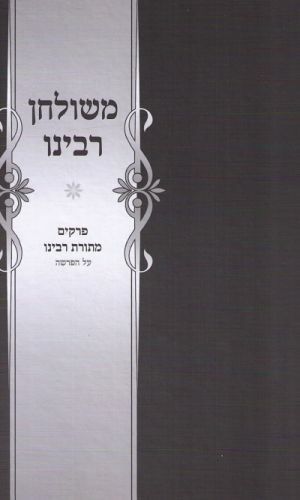 Author: Anonymous Description: An excellent choice for the Shabbos Table, providing basic Brelover concepts and short inspiring thoughts on the "Parsha" (portion of Torah reading ) of the week. Compiled by "Bnei Yeshiva" in Kiryat Sefer, it is geared to young and old alike and designed to enhance the Shabbos meal. Publishing data: Kiryat Sefer 2014 339pp. 6x9" HB with nekudos.